The Colorado DOT – TAMP is available here. Colorado DOT's TAMP seeks to address Colorado's vast, multimodal system of transportation, as well as public demands for increased performance despite decreases in funding. The TAMP aims to provide a framework for incorporating asset management strategies and performance-based decision making into Colorado DOT's programming in order to take a holistic, efficient approach. 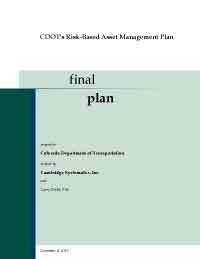 Colorado DOT seeks to integrate life cycle analysis and risk analysis into their planning processes, thus equipping the agency to budget effectively, manage risks, and maximize return on investments. This document includes the following sections: Communications and Reporting, Current Methods and Tools, Financial Plan, Future Demand, Introduction, Inventory and Condition, Investment Strategies, Levels of Service, Lifecycle Management, Objectives and Measures, Performance Assessment, Process Improvements, Regulatory and Legislative Requirements, Risk Management.